DRV's Mobile Suites set the bar for four-season, full-time, and sub-zero RVing, with all of the comforts of home. 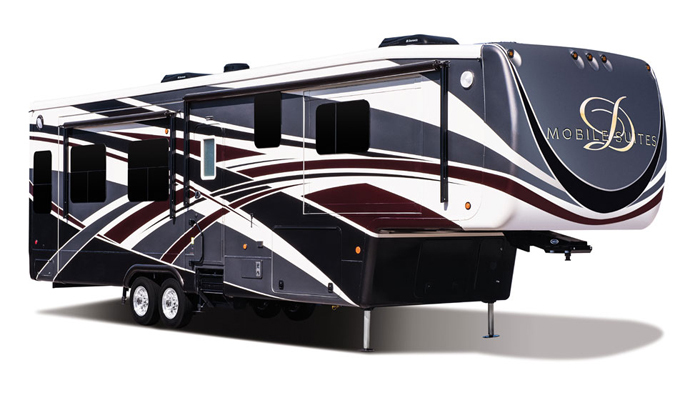 Mobile Suites offer uncompromised luxury, the convenience of a residential kitchen—including residential refrigerator, dishwasher, garbage disposal and soft-close drawers—and the kind of living space that truly makes your fifth wheel a traveling home. Thestraight roof-line dramatically increases storage while giving the Mobile Suite a modern, fresh look. The Mobile Suite is available in more than two dozen different floorplans, ranging from 32 to 44 feet lengths, with several different Queen and King bedroom/bathroom layout options.